On August 28, 2013, a tropical wave formed off of the west coast of Africa and moved westward. The tropical wave eventually developed into a large low-level cyclonic flow that extended from the western Caribbean Sea to the eastern north Pacific Ocean. From this tropical wave, two hurricanes developed, Ingrid in the western Gulf of Mexico and Manuel in the Eastern Pacific. Intense tropical rainfall inundated Mexico’s Pacific and Gulf coasts when both storms made landfall during September 15-16, 2013. Storm induced floods and mudslides resulted in over 130 casualties and more than 500 million dollars in damage. 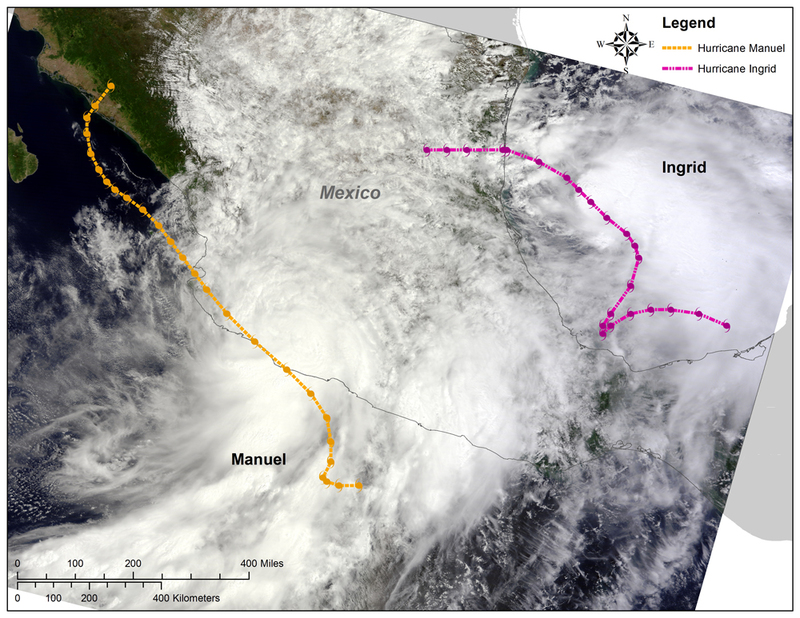 Late on September 14th, Ingrid strengthened into a hurricane and was headed for the coast of Mexico near Tampico with peak sustained winds of 75 mph. As a part of the HS3 Field Campaign, NASA's Global Hawk 871, an unmanned aerial aircraft, flew over Ingrid on September 15th carrying instruments that measure radar reflectivity which can be used to derive wind speed and rain rates. Can areas of heavy rain and wind be identified within Ingrid ahead of landfall? The Hurricane and Severe Storm Sentinel (HS3) airborne field campaign studied processes that influence hurricane formation and intensity change in the Atlantic Ocean basin. HS3 leveraged two NASA Global Hawk unmanned aerial systems which can fly for up to 24 hours, have an 8,500 nautical mile range and are capable of carrying large payloads of scientific instruments. During the September 15, 2013 flight, Global Hawk 871, carrying the HIWRAP, HIRAD, and HAMSR instruments, flew over Hurricane Ingrid. A few passes were made through Ingrid before extreme cold temperatures forced the Global Hawk to return to base. Data collected during the HS3 field campaign, including the September 15th Ingrid flight, are available at the GHRC DAAC. Brown, S.T., B. Lambrigtsen, et al., (2011): The High-Altitude MMIC Sounding Radiometer for the Global Hawk Unmanned Aerial Vehicle: Instrument Description and Performance, IEEE Transactions of Geoscience and Remote Sensing, 49, 3291-3301, http://dx.doi.org/10.1109/TGRS.2011.2125973. Rodger, C.J., J.B. Brundell, and R.L. Dowden, (2005): Location accuracy of VLF World Wide Lightning Location (WWLL) network: Post-algorithm upgrade. Annales Geophysicae, 23, 277–290.